American earth magnetosphere satellite. Research satellite built by Swales Aerospace (Probe) for University of California, Berkeley (for NASA), USA. Launched 2007. Status: Operational 2007. First Launch: 2007-02-17. Last Launch: 2007-02-17. Number: 5 . Payload: 26 kg (57 lb). Gross mass: 126 kg (277 lb). Unfuelled mass: 77 kg (169 lb). 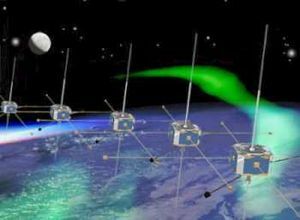 Specific impulse: 200 s.
The five Time History of Events and Macroscale Interactions during Substorms (THEMIS) satellites were part of a combined ground- and space- based system designed to determine what physical process in near-Earth space initiate the violent eruptions of the aurora that occur during substorms in the Earth's magnetosphere. The THEMIS satellites would conduct a two-year mission in conjunction with the ground-based elements. The THEMIS probes would line up over North America once every four days. Over the mission's two-year lifetime, the probes were expected to observe some 30 substorms. THEMIS was the fifth medium-class mission under NASA's Explorer Program, managed by the Goddard Space Flight Center, Greenbelt, Maryland. The University of California at Berkeley's Space Sciences Laboratory and Swales Aerospace, Beltsville, Maryland., built the THEMIS satellites. Flux Gate Magnetometer (FGM), to measure the background magnetic field in order to identify and time the abrupt reconfigurations of the magnetosphere during substorm onset. Search Coil Magnetometers (SCM), to measure low frequency magnetic field fluctuations and waves in three directions in Earth's magnetosphere. Electrostatic Analyzer (ESA), to measure thermal electrons and ions in order to identify and track high-speed flows through the magneto tail and identify pressure pulses. Ground-Based All-Sky Imager (ASI) Array to observe the aurora over the Northern American continent from Canada to Alaska in order to determine where and when the auroral substorm onset occurs. Ground-Based Magnetometer (GMAG) Array, to measure changes in the Earth's magnetic field near Earth's surface due to substorm onset in order to help determine the timing of substorm events. Cost Notes: Total mission cost $200 million, including 5 satellites, lv. Spacecraft delta v: 940 m/s (3,080 ft/sec). Electric System: 0.0400 average kW. The THEMIS-B (THEMIS-P1) and THEMIS-C (THEMIS-P2) were repurposed to study the lunar environment in 2009. In late 2009, the remaining fuel in both spacecraft was used to send them to orbit the L1 and L2 points, opposite the near- and far-sides of the Moon, respectively. The spacecraft were renamed ARTEMIS (Acceleration, Reconnection, Turbulence and Electrodynamics of the Moon's Interaction with the Sun), with the P1 and P2 designations maintained. ARTEMIS-P1 reached the L2 Lagrange point on 25 August 2010, and ARTEMIS-P2 reached the L1 Lagrange point on 22 October 2010. Both spacecraft were then moved into equatorial lunar orbits with periapsis altitudes of approximately 100 km and apoapses of 19000 km, with periods of 26 hours, in June and July 2011. The scientific objectives of the repurposed ARTEMIS mission are to study how particles are accelerated at reconnection sites and shocks, how turbulence develops and evolves in Earth's magnetotail and in the solar wind, and the structure, formation, refilling, and downstream evolution of the lunar wake and particle acceleration processes within it. 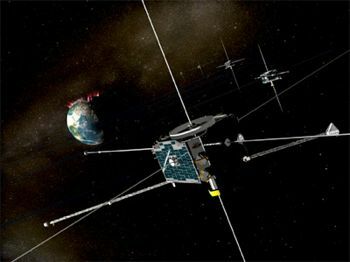 The Time History of Events and Macroscale Interactions during Substorms (THEMIS) mission is a five-satellite Explorer mission whose primary objective is to understand the onset and macroscale evolution of magnetospheric substorms. Most importantly, THEMIS will find out which magnetotail process is responsible for substorm onset: (a) a local disruption of the plasma sheet current; or, (b) that current's interaction with the rapid influx of plasma emanating from lobe flux annihilation at ~25Re. Three inner probes at ~10Re will monitor current disruption onset, while two outer probes, at 20 and 30Re respectively, will remotely monitor plasma acceleration due to lobe flux dissipation. The five small satellites were launched together on a Delta II rocket and they carry identical sets of instruments including an electric field instrument (EFI), a flux gate magnetometer (FGM), a search coil magnetometer (SCM), a electro-static analyzer, and solid state telescopes (SST). The mission consists of several phases. In the first phase, the spacecraft will all orbit as a tight cluster in the same orbital plane with apogee at 15.4 Earth radii (RE). In the second phase, also called the Dawn Phase, the satellites will be placed in their orbits and during this time their apogees will be on the dawn side of the magnetosphere. During the third phase (also known as the Tail Science Phase) the apogees will be in the magnetotail. The fourth phase is called the Dusk Phase or Radiation Belt Science Phase, with all apogees on the dusk side. In the fifth and final phase, the apogees will shift to the sunward side (Dayside Science Phase). All five satellites will have similar perigee altitudes (1.16-1.5 Re) but varying apogee altitudes (P1: ~30 RE, P2: ~20 RE, P3 & P4: ~12 RE, P5: ~10RE) with corresponding orbital periods of ~4, 2, and 1 days, respectively. This results in multi-point magnetic conjunctions. Every four days the satellites will line up along the Earth's magnetic tail with magnetic foot points in the North American sector, allowing the tracking of disturbances through different geospace regions from tail to ground. The satellite data will be combined with observations of the aurora from a network of 20 ground observatories (all sky imagers, magnetometers) across the North American continent. In addition to its primary goal, THEMIS will answer critical questions in radiation belt physics and solar wind - magnetosphere energy coupling. THEMIS is complementary to MMS in terms of the temporal and spatial scales of the phenomena observed by these two constellation missions. THEMIS's focus is macroscale, whereas MMS will observe micro/meso scale features. Family: Earth, Magnetosphere sat. Country: USA. Launch Vehicles: Thor, Delta 7925, Delta 7925-10C. Launch Sites: Cape Canaveral, Cape Canaveral LC17B. Agency: Swales. Bibliography: 6981, 13274. 2007 February 17 - . 23:01 GMT - . Launch Site: Cape Canaveral. Launch Complex: Cape Canaveral LC17B. Launch Pad: SLC17B. LV Family: Thor. Launch Vehicle: Delta 7925-10C. Themis P1 - . Payload: Themis A. Mass: 125 kg (275 lb). Nation: USA. Agency: NASA. Manufacturer: Swales. Class: Earth. Type: Magnetosphere satellite. Spacecraft: Themis. USAF Sat Cat: 30580 . COSPAR: 2007-004A. Apogee: 87,254 km (54,217 mi). Perigee: 1,003 km (623 mi). Inclination: 14.10 deg. Period: 1,882.70 min. The five simultaneously-launched Time History of Events and Macroscale Interactions during Substorms (THEMIS) satellites were the fifth medium-class mission under NASA's Explorer Program. They formed part of a combined ground- and space- based system designed to determine what physical process in near-Earth space initiate the violent eruptions of the aurora that occur during substorms in the Earth's magnetosphere. Themis P2 - . Payload: Themis B. Mass: 125 kg (275 lb). Nation: USA. Agency: NASA. Manufacturer: Swales. Class: Earth. Type: Magnetosphere satellite. Spacecraft: Themis. USAF Sat Cat: 30581 . COSPAR: 2007-004B. Apogee: 87,114 km (54,130 mi). Perigee: 1,004 km (623 mi). Inclination: 14.10 deg. Period: 1,878.80 min. Themis P3 - . Payload: Themis C. Mass: 125 kg (275 lb). Nation: USA. Agency: NASA. Manufacturer: Swales. Class: Earth. Type: Magnetosphere satellite. Spacecraft: Themis. USAF Sat Cat: 30582 . COSPAR: 2007-004C. Apogee: 87,792 km (54,551 mi). Perigee: 736 km (457 mi). Inclination: 14.20 deg. Period: 1,890.30 min. Themis P4 - . Mass: 125 kg (275 lb). Nation: USA. Agency: NASA. Manufacturer: Swales. Class: Earth. Type: Magnetosphere satellite. Spacecraft: Themis. USAF Sat Cat: 30797 . COSPAR: 2007-004D. Apogee: 67,517 km (41,953 mi). Perigee: 4,048 km (2,515 mi). Inclination: 4.60 deg. Period: 1,435.90 min. Themis P5 - . Mass: 125 kg (275 lb). Nation: USA. Agency: NASA. Manufacturer: Swales. Class: Earth. Type: Magnetosphere satellite. Spacecraft: Themis. USAF Sat Cat: 30798 . COSPAR: 2007-004E. Apogee: 67,523 km (41,956 mi). Perigee: 4,045 km (2,513 mi). Inclination: 5.10 deg. Period: 1,436.00 min.